Welcome to the eighth Sourced Report – your insight into the Christchurch, and now Auckland, IT sector. The data we have collected over the course of our research allows us to provide Canterbury and Auckland technology professionals with the most up to date trends and changes occurring in your local market. The Sourced Report has now been providing insights into the Christchurch IT sector for three years. From this year on, we’ll also be examining the Auckland IT sector, analysing the unique trends and movements in the market as well as exploring how it compares with Christchurch. In Christchurch, hiring over the last six months was significantly more subdued compared to the six months before, with just 57% of organisations taking on IT professionals since September. In Auckland, by contrast, 100% of employers that responded to the survey stated that they hired IT professionals in the same time period. This is likely due to a slight shift that we saw in the Christchurch market around Spring of last year, where the focus was more on BAU activities, with fewer larger projects in the market resulting in less job movement for IT professionals. down, a significant number of organisations filled a larger number of IT roles, with half of the employers that had hired IT professionals hiring five or more in the last six months. This hiring decrease also had an impact on the other side of the spectrum, with no employers reporting that they were able to successfully hire for every role they tried to fill – suggesting that the relative lack of movement made the talent market more competitive. companies where more than 50% of the workforce was IT-focused had all recruited for ten or more IT roles, and in companies where less than 50% of the workforce was IT focused, two thirds of them hadn’t recruited for any IT roles at all. (the first time this had featured as a key reason) were also listed as significant drivers for recruitment. This could point to organisations undertaking more granular, tech-specific projects, after what was at times a turbulent 2017 for businesses; which could also be linked to the increased demand for Security Specialists. 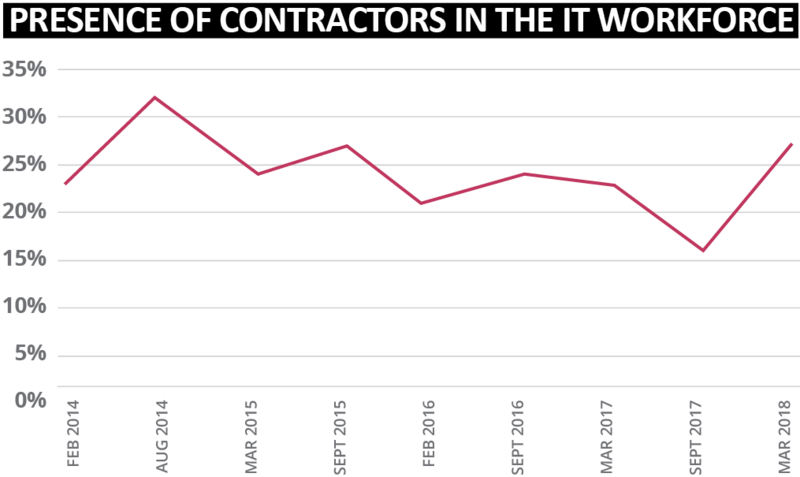 After two decreases in a row over the past 12 months, we’ve seen a significant increase in the number of contractors in the market this time around. 27.16% of Christchurch respondents and 26.32% of Auckland respondents stated that they were working as contractors, a big rise from around 16% just six months ago. This is one of the higher levels of contractors that we’ve seen in the market over the past four years, which could be a reflection of the kind of projects that organisations are currently undertaking. Technology upgrade projects, for example, require more in the way of specialist skills and expertise. contractors want out of their jobs. Much like the rest of the field, the aspects of their jobs they enjoyed most were flexibility, variety of work, and access to good technology. Surprisingly, considering the perception that contracting is a lucrative pursuit, financial incentives were a clear fourth behind these three elements. In terms of attractors for new roles, work/life balance, challenges and career opportunities were leaders, again comparable to permanent employees. In essence, this shows that while they may be engaged on a different basis, contractors are not all that different from permanent employees in terms of their motivators and the aspects of their role that keep them happy. Another key discussion in the Tech industry, and the workforce at large, is around the differences between generations. There is a school of thought that states different generations have different motivators and priorities at work, and need to be treated differently in the workplace. However, once again, our data suggests that demographics aren’t necessarily the key differentiator. To examine age group differences, we broke the data down into 18-30-year- olds, 31-50-year-olds, and 51+-year- olds. Much like the other comparisons we’ve drawn between gender and employment-type, we found very little discrepancy between what people at different age brackets wanted out of their roles. Work/life balance, challenges, variety of work, and flexible hours all featured prominently across every age range. Most differences in the way that each generation approached their work had more to do with lifestyle changes outside of work, and the fact that age and career development are linearly correlated, rather than any specific attitude to employment. For example, those in the 51+ age bracket placed the lowest importance on salary out of all of the generations, because they’re most likely to be already well into their careers and have reached their peak in terms of earnings. Whereas the 18-30-year- olds valued career opportunities the most, as that’s what they need most to progress their careers. However, our survey also highlighted a number of issues with the assumptions that are often made about the market. several different roles in a short space of time. However, according to our data, the 18-30 bracket wasn’t any more likely to move jobs than either of the others. In fact, most of the numbers were fairly comparable, with the 31-50 bracket being the highest when it came to the percentage of people currently looking for a new role. Additionally, those at the younger and older ends of the spectrum stated that it was harder to progress their careers than those in the 31-50-year- old bracket. Another issue was highlighted when it came to salary satisfaction. Across the board, there was a fair level of discontent when it came to salary. However, the most dissatisfied group was the group to whom salary had the least importance: 51+-year-olds, 43.18% of whom stated that their salary did not reach their expectations. With the issues New Zealand faces in terms of the ageing workforce, this is a warning sign of sorts for employers, showing that experienced workers still need to be compensated fairly for their work, else they’re at risk of becoming disengaged. 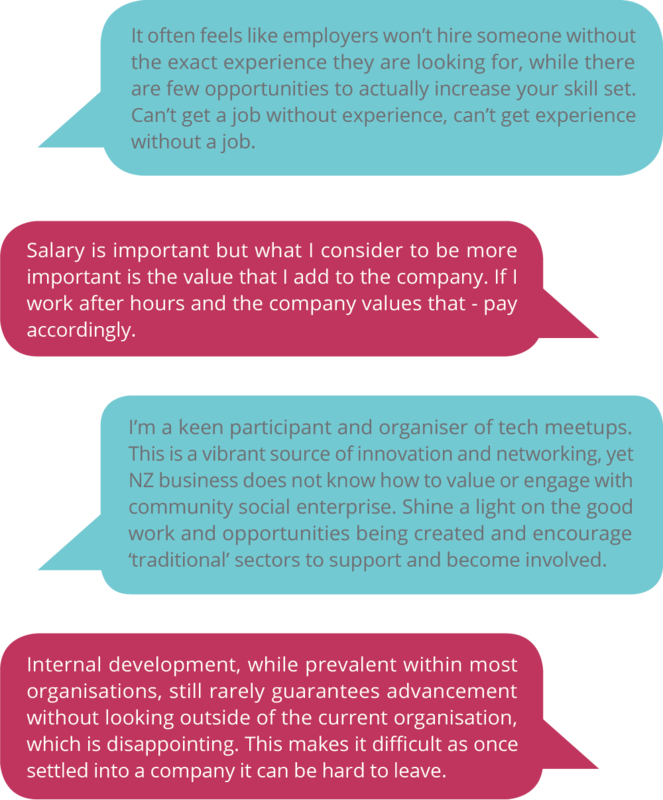 These older employees still have a lot to offer organisations, and it’s crucial that their skills and knowledge are passed on so future leaders can flourish. One positive sign is the prevalence of flexibility across all generations. Amongst the 31-50 bracket, 79.81% were receiving flexible working hours – compared to 68.18% of 51+year- olds and 50.46% of the 18-30-year-old group. Considering that flexibility and work-life balance are top priorities for IT professionals throughout each demographic, it’s encouraging to see that employers are increasingly able to provide this. than men, with an average of 3.69 compared to 3.46 for men. benefit, compared to 34.85%of men. A clear theme emerges from these statistics, and while progress is certainly being made when it comes to gender equality and diversity in the Technology sector, it’s important to remember that there is still a long way to go. There are still inequalities to overcome, and it’s only by rectifying them that we’ll be able to build an industry where everyone has the opportunity to succeed. Thank you again to everybody who has participated in the survey and contributed to the Sourced Report. 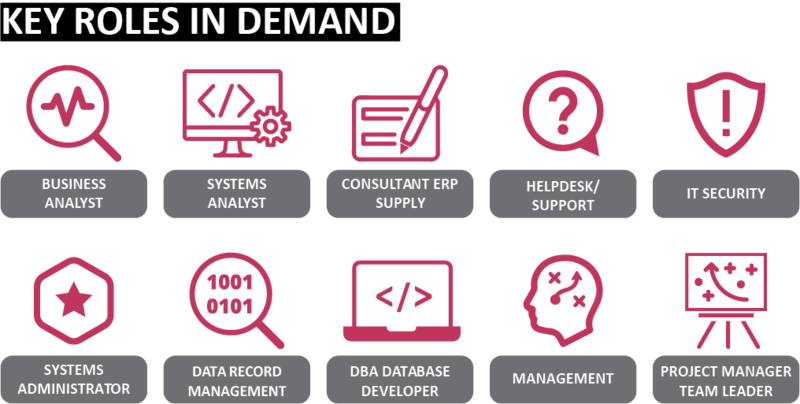 It’s been an interesting six months in the Christchurch and Auckland IT sectors, with a range of different market factors resulting in some unique outcomes when it came to recruitment time. We’re seeing the long-term cyclical trend around contracting pick up again, as well as new variables driving hiring activity. want to be challenged, they want to be valued, they want to be afforded flexibility, they want to be paid fairly, and they want to be supported to succeed. This doesn’t tend to change, no matter how old they are, how they’re engaged, or whether they’re male or female. While individual people will want individual things on a more granular level, getting the foundations right by meeting these needs is critical to retaining your best people. This isn’t a movement-shy market, and if IT professionals believe that they would be happier elsewhere, they’ll be open to moving on.